Reinhard Eugen Tristan Heydrich, 1904-1942, and Heinrich Himmler, 1900-1945. 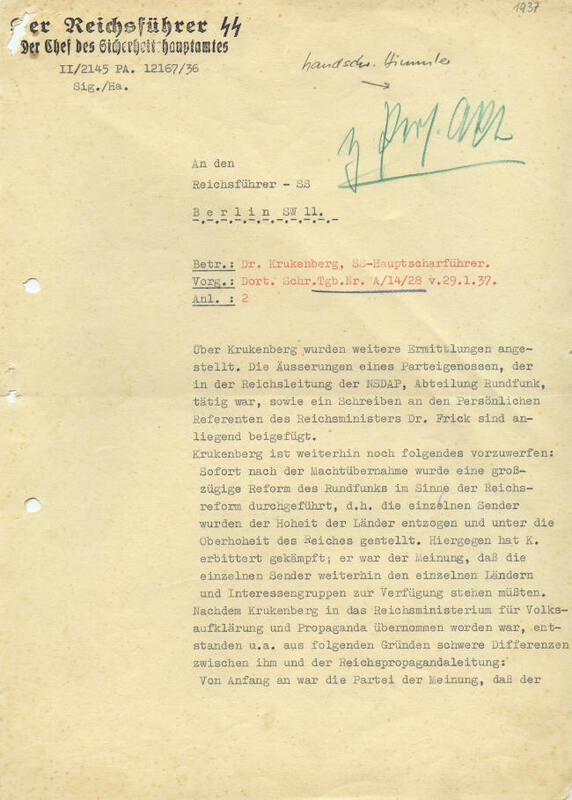 Rare and important Typed Letter Signed, Heydrich, and annotated by Himmler, two pages, 8¼" x 11¾", on stationery of Der Reichsführer SS / Der Chef des Sicherheitshauptamtes, no date [March 1937], no place. In German, with translation. Autograph material of the brutal Heydrich, who headed the Gestapo and was second in importance only to Himmler in the Nazi SS, and who was a principal architect of the Nazis' plan to exterminate the Jews, is rare. 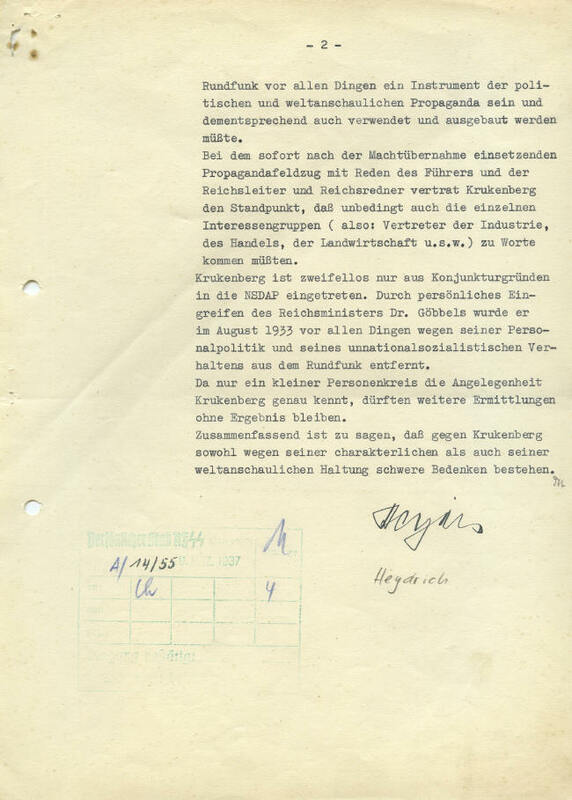 This letter is much rarer still: It was written to Himmler; it concerns a third SS officer, Dr. Gustav Krukenberg, who ultimately became one of the last SS defenders in the battle for Berlin; and it is annotated by Himmler himself. 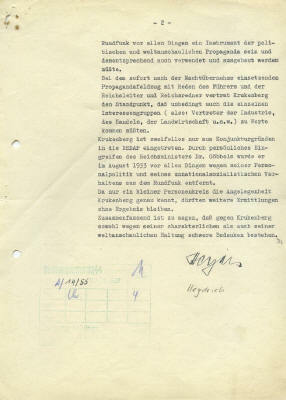 Heydrich reports to Himmler on the investigation of Krukenberg. He describes Krukenberg's differences with the Nazi propaganda ministry, refers to Krukenberg's "un-Nazi attitude,” and concludes that ”serious doubts persist against Krukenberg, not only because of his character but also his ideological attitude." The letter is an excellent example of Gestapo suspicion—not only of dissidents, but of other Nazis themselves. This letter is in very fine condition. Both Heydrich's signature and Himmler's handwriting are extremely bold. The letter has two file holes, small stains, and some paper loss, apparently from staples that have been removed. There is a pencil notation “1937" in the upper right corner of the first page, and there are pencil notations of “handschr. Himmler" (in English, “handwriting of Himmler") on the first page and “Heydrich" on the second page. 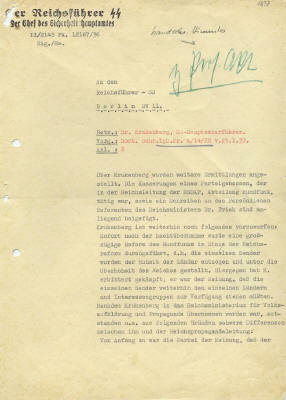 There are also SS staff notations at the bottom of the second page indicating that Himmler received the letter on March 9, 1937. While we reject Nazism and all that it represented, we offered this letter because it is an outstanding historical piece that belongs in the finest World War II collection. items that we are offering.